“Delicious as a dressing, Remarkable as a Marinade” - Get More out of your Dressing. I've been making a concerted effort to get dinner on the table and eat as a family lately, but this time of year is hard since we're gone a lot with sports practices and end of the school year activities. I need something I can fix without a lot of preparation time, but that isn't the same old thing each day. Additionally, with the weather getting warmer (at least some days, anyway) it's time for some lighter fare and I learned about some great salad ideas from Wish-Bone. When I was growing up, we had a salad at just about every dinner, and it was always in those wooden salad bowls. Wish-Bone was the only salad dressing I knew of, and as far as I knew there was Italian and French and we had it on lettuce, carrots and radishes when they were in season. I wasn't until later I found out about "exotic" flavors such as Thousand Island and Russian, but those went on lettuce, too. Now, there's so many great Wish-Bone Dressing products and so much more you can create and use it for such as marinades, sandwiches and lots of different salads beyond just lettuce. As a matter of fact, each Wish-Bone Salad Dressing bottle comes with a recipe right on it. They all turned out great! The Mandarin Chicken Salad has an unexpected combination of ranch dressing and orange marmalade, and it really works for the salad. It wasn't as big of a kid favorite as the other two recipes, but the adults loved it. Potato Salad is it's own food group here in the South, and the Creamy Red Potato Salad did not disappoint, the whole family gave it a thumb's up. It has simple ingredients and didn't take long to prepare. I will probably add a little more mustard to it next time, but it won't be in the fridge for long! The Easy Mediterranean Pasta Salad is Busy Girl's personal favorite and the rest of us aren't allowed in it. However, I did sneak some, it's great and hearty enough for a meal. There's not a carbohydrate that is safe from my 12 year old son, so I venture a guess that it won't be around long, either. Enter for a chance to win a $100 Grocery Gift Card and a Wish-Bone prize pack (valued $46.10). To enter, leave me a comment below telling us about how you use Wish-Bone Salad Dressing - or you may leave a link to your post on your own blog in the comments below. The contest will begin at May 18, 2009, 9:00 a.m. PST and will end June 30, 2009, 5:00 p.m. PST. Make sure that the e-mail address you leave is correct. * You may receive an additional entry by linking on twitter and leaving a link in the comments. * You may receive an additional entry by blogging about this contest and leaving a link in the comments. * Winners will be selected via random draw using a random number generator, and will notified by e-mail. Check out the other BlogHer Reviewer's Wish-Bone recipes successes and enter for an additional chance to win a $100 Grocery Gift Card and Wish-Bone prize back at the BlogHer Special Offers Page. Upgrade your salads with Wish-Bone® Dressings. Visit the Wish-Bone site for great recipe ideas for your family. Please come visit me at Busy Mom Blog! I like to marinate chicken with the italian dressing. Thanks for the contest! I just sent out a tweet!! we love a great stir-fry every now and then with or without meat. It's easy to make with Wishbone Light Italian dressing. Combine 1/2 cup Wishbone Light Italian salad dressing, 1 Tablespoon soy sauce, and 2 tsp. ground ginger. Add to your stir-fried meat and vegetables. Serve over rice or even as a wrap. I blogged about this give away! The Italian dressing is great to marinate pork chops in before grilling them. Or, as a kid, we had shake & bake pork chops, then used the Italian dressing as a dipping sauce. We use it on salads alot but I also like to marinate with it. I marinate beef, chicken and chops with Italian or Viniagrette. It adds great flavor to the meat. i'm a fan of marinades on anything: chicken, beef, fish. flavors don't matter, just a complement to whatever the side of the evening happens to be. Wish Bone is the tastiest! Okay, I'm boring. I do happen to use salad dressing mostly on salad. But I love Wish Bone Ranch dressing-- it's been a wonderful addition to my low-carb lifestyle for years. I use Wish Bone dressing on my salds. My husband uses the Ranch dressing on everything, pizza rolls, salads, even cheese sticks. I love dressing on my salads and that is what I will use t for! I use it to marinate fish and chicken. I use Wish-Bone Italian Dressing to marinate chicken breasts before grilling, and of course, my entire family loves Wish-Bone Dressings on their salads! I use it to marinate all my meat including beef and pork. I marinade chicken in italian dressing and lime juice and a little honey. Yumm. The chicken tastes fantastic. I love to use Wishbone Italian to marinate my steaks before I throw them on the grill and to add to cold green beans, I like them so much better with the Italian dressing rather than hot. We love to use Wish Bone Italian Dressing mixed in with cold bow tie pasta, add in fresh sliced carrots, red peppers, and kidney beans. We love this. This sounds gross but I swear you will lick the plate. It was born of a poor social worker's bare cupboards. But wait until fall. Nothing like this is good in the summer in the south. Wishbone Robust Italian dressing, a can of cream of mushroom soup, 6 pork chops, and a crockpot. I don't know what happens in the dark crockpot between the soup (and I'm not a cream of mush soup casserole person) and the dressing but it makes this amazing gravy-ish thing - serve it all over noodles or rice. Yum! I have pretty much only used salad dressing for salad, or dipping veggies, but the idea of using it as a marinade is interesting, I will have to try that soon! I use WishBone light in my pasta salads! I use whole wheat pasta with fresh veggies and use the WishBone dressing for seasoning and flavor. It is delish! Wish Bone Italian dressing on salad, pasta, fresh fruit, added to soups, and spritzs on bread then toasted. I'd use Wishbone Italian dressing to marinade some scalloped potatoes. I love marinating Pork Steak with a combination Wish Bone Italian and soy sauce. It takes an extremely cheap cut of meat and turns it awesome! I also use it to marinade all of the vegetables and various meats for our shish ka bobs. I use the Italian as a marinade for chicken and on salads. I like to use ranch with mayo in tuna salad. I use Wish Bone Italian dressing as a marinate. I have been doing this for years. I marinate chicken, fish and sliced potatoes in Wish Bone Italian, which I then place on the grill. The Easy Mediterranean is all mine. My sister hates pepperoni, so I can make it for me. I have to go with the crowd that marinates chicken breasts in the Italian dressing before throwing them on the grill. Looking forward to trying the Mediterranean salad though! Being a vegetarian does limit my recipes lol, but I love to make a huge, cold spinach salad with cooked wild rice, sliced blanched almonds and Wish Bone Italian drizzled all over. Sprinkle a few shakes of Parmesan cheese and cracked white pepper for a GREAT healthy summer time meal! Microwave peas until they are hot, add the Wishbone and Italian seasoning. I marinate chicken with the Italian dressing. I use it on salads, meat, pasta salads-just about anything. I just use it for salad, but I eat a lot of salad. I must have ten different flavors of salad dressing in the fridge to suit whatever mood. I use the Wishbone Italian dressing to marinate steaks for the grill. About two hours before they hit the grill I run both sides of the steak with the Italian dressing then add some freshly ground pepper. We formerly used Wishbone Italian dressing only for salads but I've discovered that it is a wonderful marinade for steaks and chops. I use the italian as a marinade for chicken. I use Ranch dressing as a dip for chicken wings and fresh veggies. I also use it in my chicken salad instead of mayonnaise. I use it as a marinade for chicken and I also cut up cucumbers and use italian dressing as a light topping on them. I use Wish-Bone Italian to marinate chicken and the grill it. Very good! We use it on our salads, wings, dips for veges, a marinate, ect! Besides using various Wish Bone dressings on salads, I also use their Italian dressing to marinate portabella mushrooms, and as an ingredient in my black eye pea salsa. I use Wish-Bone Italian Dressing to marinate chicken breasts or kabobs before grilling, my family loves Wish-Bone Ranch Dressing on their salads. We eat a lot of salads, and that is the way that we use WishBone. The really great thing is that there are several varieties so everyone can have their favorite, and that the prices are reasonable. It doesn't hurt that I often have coupons as well. I use it for marinating chicken and on pasta salad. I marinate chicken in the italian dressing...like so many others. But, I also put 2 tbls of Wish-Bone Western With Bacon Flavor in my meatloaf instead of ketchup. Ohh..so good and tangy. I use the Italian dressing for chicken & steak marinade, dressing on pasta salad, an ingredient in the sauce I use on potato salad. I also like to dip cold leftover beef roast in it! I use WishBone Light Ranch in my pursuit of healthiness. I would like to try some of their other healthy options as well. I have used their Italian dressing as a marinade, but I haven't done that in quite a while--I need to try it again soon! Thanks for the contest! I'm not a big cook, but I do love salads and Wish bone is my favorite Italian dressing. I use Wishbone Italian as a marinade for steaks. I also love making my pasta salad with Wishbone. I use Wishbone Italian to marinate steak and I use Wishbone Ranch to dip my steak in ! I use it on my wraps. I also use the fat-free Italian on sandwiches. Yum! I use it as a marinade, a salad dressing and on pasta salad. I use the Italian dressing when I'm baking salmon. I marinate the salmon for 15 minutes before baking at 350 for 20 minutes. Until the fish flakes. I like to use the italian dressing as a marinade for chicken to be grilled. Mostly as dressing on a green salad. I use italian as a seasoning for fish made in the foil pockets on the grill. On plain old salads when I feel like eating healthy for a change. We marinate chicken in it and then use the chicken to make sandwiches. The most delicious sandwiches in the world. Much better than boring deli meats. When I have leftover steamed green beans, broccoli, or asparagus, I use the Italian dressing to marinate them. The combo makes a great cold vegetable side dish. I would use this on salad since it looks like better dressing than the nasty fat free ranch in my fridge! I use it to keep lunch sandwiches intersting - just change the dressing and a new flavor emerges! I use the Italian as a marinade and ranch for a veggie dipping sauce ... yum! I use it on salads but it can be put on potatoes, too. Besides as an actual dressing on salad, I like to use it as a marinade for beef before grilling. I use it quite often to marinate meat. I use Wishbone's Sweet & Spicy French in a slow cooked pot roast. It's easy and good. I use it to marinate my chicken. I love to use it on pasta. 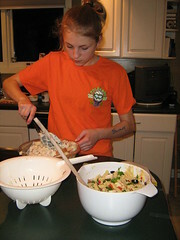 In the summer, it is usually a cold pasta salad with in season vegetables. I prefer the vinaigrettes, but any dressing will work. I make a cool summer salad of peas, corn, tomatoes, and cucumber. Mix with freshly ground pepper, a little salt, and Wishbone Italian Dressing. Then top with sliced hard boiled eggs. Then a dash of paprika. I like to use it on green leafy salads. Love Wish Bone! Use it to marinate meats and salmon and I make huge salads with it also. Thank you! I use Wish Bone on our salads which I serve several times per week and also use it as a marinade for meat and as a dressing for vegetables. This makes the easiest marinade around. I put my chicken or steak in a bowl, dump a bunch of dressing on top and let it soak in all day. By the time dinner rolls around, I just have to throw the meat on the grill and it's soooo tasty. My favorite recipe I've made so far is a rotini pasta salad with rotisserie chicken salad, kalamta olives and artichoke hearts with Italian dressing. I use italian dressing with my chicken in the crockpot. I like the bagged variety of lettuce with veggie toppings on it, hard boiled eggs and add a touch of Wish-bone and that is great! I like using their Italian dressing for marinating chicken and also for making pasta salad. I like to mix the Italian with cream cheese and use it in recipes. Yum! I mix Italian wish bone in ground beef for some yummy hamburgers! I use it on my dinner salad, but I also use it to make a rotini salad with chick peas, brocolli florettes, carrots, and kidney beans. I use Wish-Bone salad dressing on my salads and raw veggie snacks! I like to use the Italian dressing to marinade my chicken in! I love to use Wish-Bone as a special ingredient in my potato salad! I've been using italian dressing to marinate meats and fish for years now! 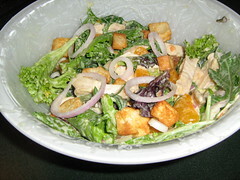 Thanks for sharing your pictures, the mandarin chicken salad looks interesting, I might try that one! I mix 1 cup of their Ranch dressing with 1/4 cup of grated Parmesean, 2 cups of leftover grilled or boiled chicken (diced or chopped into 1/2 inch or smaller pieces), and 4-5 cups of shredded romaine lettuce and I get the worlds most fabulous chicken caesar salad in MINUTES. This is really important to me because I work a full time job and so does my hubby, so by the time I get home it’s around 5:30 p.m. and I have a starving hubby coming home at 6:00 p.m. and two starved kids waiting for me. I use wishbone all the time to marinate pork, chicken, etc. I was so excited to see the recipes at the Wish Bone site. I'm embarrassed to say that I haven't used it for anything but to put on a salad. Sheesh! Can you say underutilized? we just use it as a salad dressing, but I now it is good with pasta salads, and as a marinade for chicken dishes. I love using the dressings to add to rice or mashed potatoes. It gives them an extra added zing. I use wishbone salad dressing in my pasta salad. I use their Italian dressing as a marinade for meat. We use it to marinate boneless chicken for grilling -- Yummy! I use salad dressing for potato salad and as marinades, as well as on regular salad ingredients like lettuce. I use it on salads and as a meat marinade. I use Wishbone Ranch for a snack to dip my carrots in. Thanks for offering this nice prize. I've often used Wish-bone Italian dressing as a marinade for chicken or steak before grilling. Adds flavor and seems to tenderize the meat, too. I marinate meats in my wishbone. I dip red pepper slices & baby carrots in Ranch dressing. I use Wishbone dressing for numerous things, especially as a marinade for meats. I also brush it on kebabs and marinade cheese cubes in it..then served on toothpicks. We love it! I love the italian as a marinade!!! I use Wishbone often. I marinate meats with it and in the summertime, nothing like fresh cucumber, vine ripened tomatoes with thinly sliced garden fresh onions, marinated in Wishbone Italian dressing. Adding Wish Bone Italian dressing to ground beef makes the most delicious grilled burgers. And its great the old favorite salad as well! I like to use it as an oil replacement when I make enchiladas. Yum! 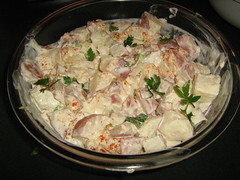 Creamy Red Potato Salad sounds good to me from your recipe tryout so I will give that a go. At my house Ranch is always around so it is used for everything from french fries to pizza to chef's salads. I mostly use salad dressing on salad (boring, I know, but tasty). One thing I have tried is using a little salad dressing when I make egg salad. Honey mustard is particularly tasty in this dish. We use it on salads of course and also for marinating chicken and for yummy dips. I like to make a salad with tomatoes, onions and cucumbers with Wish Bone Italian dressing. I haven't used it for cooking, just the Ranch dressing on my salads or sometimes the Italian. I add the Wish Bone Italion dressing to my wifes chicken enchiladas. Yummy!!! I like to marinade steaks overnight in Italian Dressing. Then put them on the grill the next day! Grew up eating Wishbone Italian - my daddy's favorite. I use it as a marinade, as well as other Wishbone flavors for Pasta Salads, dips, etc. I use italian salad dressings for marinates, and of cousrse, for pasta and regular salads. I use wishbone to dampen my meat for the grill so the dry rub will stick to it. I would use it for salads! Use the italian dressing as a marinade on chicken, the put it on the grill. I use wishbone's Catalina dressing in taco salad. I use Wishbone Italian as a marinade for skinless chicken breasts that I cook on the George Foreman grill. I like it because it adds a lot of flavor without many calories. I use italian dressing as a marinade. I yet another that likes to marinade chicken in italian dressing. Maybe it's not that orignial, but it's very delicious especially on the grill. I like to add a little Italian dressing while I'm whisking my egg whites for an egg white omelet. It's so zesty I don't even need to add cheese! I also use Wish Bone salad dressings as marinades. Quick and easy. I use Wish-Bone Salad Dressing to marinate chunks of Beef and pieces of Chicken. I like to use the Italian flavor. I use it as a marinade, to dip veggies in, and of course on salads. New ways are always great too! I find as many ways as I can to eat chicken and this sounds like a good marinade for it. I use the italian to marinate my cucumbers. I marinate beef for a few hours or overnight with the Italian dressing and the grill it. It leaves the meat tasty, tender, and flavorful. I use it for marianading just about anything. Love all the Italian based products for this purpose...none has ever let me down! I marinate chicken with Italian and the Basalmic dressings. We use the spritzers a lot on both salads and subs. At our house an all time favorite is garbanzo beans, green beans, kidney beans and sliced red onions swimming in Wish Bone Italian dressing. Pour over home grown tomatoes and onions. I use Fat Free Wish-Bone Italian Salad Dressing to make a KILLER healthy Pasta Salad!! I Pour it over Chilled whole wheat pasta, added crisp steamed veggies such as broccoli, carrots etc. Add red peppers, pepper jack cheese, Parmesan and MeCormick Salad Supreme! OMLord. So DELISH and HEALTHY for summer! Wish Bone Italian dressing is a marvelous marinade for fish. Lay fish filets on a plate and brush the dressing on the top (only). Cover and refrigerate for about an hour before cooking. Delicious! Wishbone Italian dressing is used for so many different things in our house. 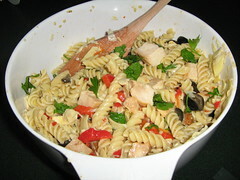 Salads, marinades and tomake my delicous pasta salad. I use wishbone salad dressings for salads , marinades, as dips for grilled meats. My kids love it. I would use the salad dressing and plain bread crumbs to coat and saute fresh tilapia filets. Yum! Come visit me at Busymom.net!